The University has officially opened the Mitali and Divyendu Kumar ASPIRE start-up centre, designed to help students develop and grow their own business ideas. The centre, based on the first floor of Sibson, the new home of Kent Business School, was opened by the University’s Vice-Chancellor and President Professor Karen Cox on Tuesday 23 January at an event attended by both Mitali and Divyendu Kumar, who made a generous donation for its establishment. 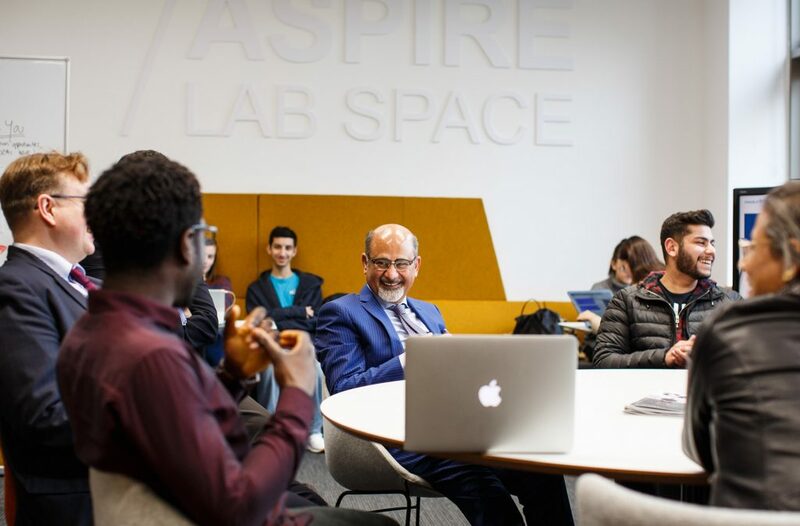 ASPIRE, which stands for Accelerator Space for Innovation and Responsible Enterprise, is designed to help students from across the University of Kent to create new start-ups and responsible enterprises by learning the necessary entrepreneurial skills to help grow a business from the ground-up. As part of this it is the home of the Business Start-Up Journey, a 12-week programme run by KBS and available to students from the School of Computing and the School of Economics, that is designed to help students create and run successful businesses. ASPIRE also funds a dedicated project officer, Rebecca Smith, to provide support to students running their businesses and an in-house ‘Entrepreneurs in Residence’, Adam Smith and Jason Marshall who run a series of events, workshops and activities to help students on the BSUJ and other ASPIRE events. Divyendu Kumar, who sits on the KBS International Advisory Board, is the Managing Director of a large automotive retailing Group with multi-country, multi-brand operations.